Lady Stepney was a novelist and London society hostess for writers and artists. Here she is depicted as Cleopatra, the queen of Egypt. The asp, which Cleopatra used to commit suicide, coils around her right arm. 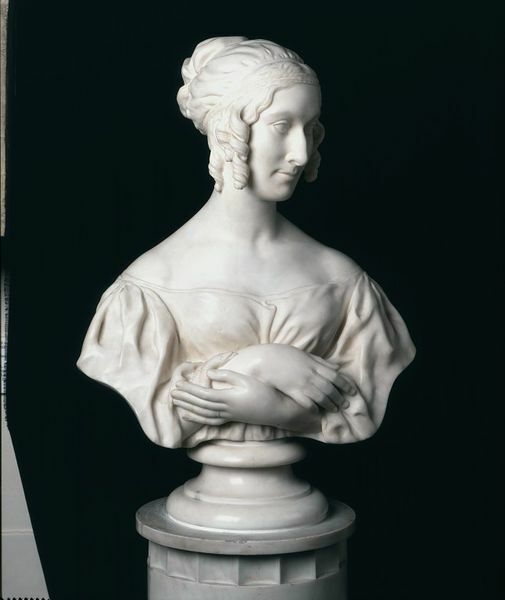 A letter to her from David Wilkie (1785-1841), dated 27 April 1836, records the installation of this bust at the Royal Academy. 'The bust of your Ladyship is placed on the right hand as you enter near the centre between the door and the window, Sir Francis Chantrey having taken as much care as he could of it. If the bust is adapted for that light, it is in other respects an excellent situation and on a level with the eye'. The bust was bequeathed to the Museum by a descendant of the sitter. A wax portrait of Lady Stepney, by the same artist, is also in the V&A. 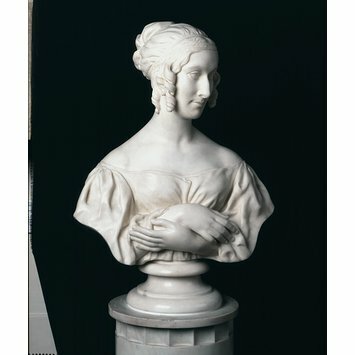 It is made by Richard Cockle Lucas (1800-1883), who is mainly known as a sculptor in wax and ivory, but he also worked in glass, marble and bronze, as well as being a painter. Lucas began his career as a sculptor as an apprentice to his uncle, who worked as a cutler in Winchester, carving knife handles. He joined the Royal Academy Schools in 1828 and studied under Richard Westmacott.